There is a great deal of chatter around the North Country today about the recently posted You Tube video of something resembling a sea monster swimming in Lake Champlain. 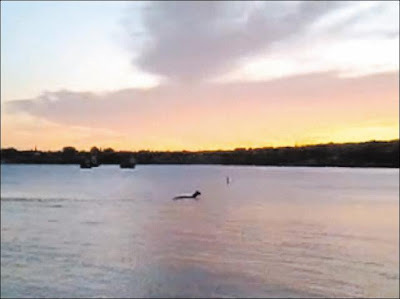 This possible recent sighting of the legendary Lake Champlain sea monster, Champ, has generated so much chatter that the local Plattsburgh newspaper even consulted a cryptozoologist for their story. It sounds like some of the experts think the image shows a moose, who are known to enjoy taking a swim in Lake Champlain. I have it on good authority, however, that "moose biologists in Vermont and New York State believe it is not a moose." Additionally, the deer biologist for the State of Vermont is "quite sure it is not a deer." The New York State deer biologist concurs. There has been some speculation among the two states' experts as to what kind of creature it might be swimming in the fuzzy video. Because of the poor quality of the video, no one will go on record with a firm, scientific statement for me, but there has been some discussion around the observation that the creature looks like an Alpaca, Llama, or perhaps a very tired Capybara. Although I relish the idea that our South American animal friends like the Adirondacks, it is my humble opinion that it is indeed the sea monster.